You are here: Home / What is Qigong? / What is the difference between Tai Chi and Qigong? People often ask what is the difference between Tai Chi and Qigong. In answering this question it is reasonable to say that Tai Chi is a branch of Qigong. More specifically Tai Chi (sometimes written as ‘taiji’ and ‘tai chi chuan’ as ‘taijiquan’) has its roots in Taoist Qigong, as distinct from Qigong’s Buddhist and Confucian traditions. So we can say that Tai Chi, first developed in the fourteenth century, is a branch of the older 3000 year tradition of Taoist Qigong. Despite sounding the same to a western ear the “Qi” of Qigong and the “Chi” of Tai Chi are not the same word. Qigong translates as something like “cultivating the Qi”, Tai Chi as “the grand ultimate”. However, they are both ways of working with Qi to achieve benefit to health and are complementary to each other. Tai Chi has a clear martial application although the vast majority of people only practice it for its benefits to health, longevity and stress management. It is a deep and precise training comprising mostly slow graceful movements performed in sequences of varying lengths. Some Qigong practices may be included within Tai Chi classes as a way of strengthening energy or supporting the demands of Tai Chi and this is often how people find their way to a Qigong class, curious to know more. Qigong often comprises sets of exercises or stand-alone practices. These do not necessarily involve movement or even standing. 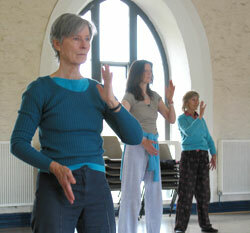 Qigong includes still and moving standing practices, sitting forms and even lying down practices. It may include walking practices, specific healing practices for different conditions, sexual practices, meditations or longer forms. To the untrained eye all slow motion movements that look a bit Chinese are often labeled Tai Chi. 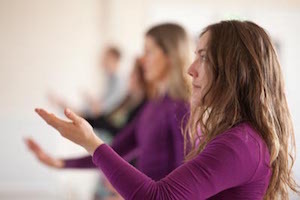 Qigong is a very broad term with a wide range of approaches that may look very different from one another. It is only really through study and practice that the differences can be explained or understood properly. However, it is fair to say that both Qigong and Tai Chi have profound effects on our wellbeing, share a common understanding of Qi and can be considered part of the Chinese tradition of healing and spiritual arts. Choosing which to train in is partly a question of personal preference, partly a question of desired outcome. Read about the Huagong style of Qigong taught by Qigong Southwest.